(English) " What seemed to be a short political crisis in 1992-1993 occurred to become an already 25 year lasting frozen conflict. 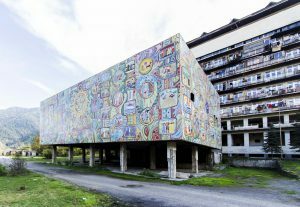 Due to this conflict, in a short period of time, the original buildings, developed during the Soviet era for institutionalized collective spa recreation was by random, DIY participation process re-designed into the new permanent collective housing." It is been almost decade since Georgia, the South Caucasus republic become popular tourist destination. This exotic fringe of the former Soviet Union remained for decades remote place associated with ethnical conflicts. A wide range of modern sanatoriums not in their original use nor design, but socially struggled rebuild environments of involuntary permanent recreants. This remained on the fringe of the interest of both tourists and architectural research. Georgian society is and thru the past centuries always was connected to the European cultural context. Thru the centuries Georgian culture was due to its geographical location influenced by Christian, Persian, Arabic, and Ottoman culture. Since the 19th century, Russian culture slowly ruled the region. By 1921 Georgia and the rest of South Caucasus became a part of Soviet Union. The next political, cultural as well as architectural tendency get under the direction of Moscow. By 1920’s and 1930’s there were several attempts to direct architecture forward progressive modern movement (constructivist) style, but compared to the situation in the Central European countries, the rise up of modern movement had no time to developed properly. In the end of 1920´s, country was forced to introduce official art and architectural style of socialist realism. Georgia had no direct contacts to western European discourse of modern movement, but still architects were able to study new trends. Khrushchev’s de – Stalinization of USSR in the late 50´s and beginning of 60´s has a strong impact on soviet architecture. In the need for cheaper and more efficient building process was introduce the term of “housing industrialization”. There was no more need for Socialist realism aesthetics and its inefficiency what officially declared open way “back” to the roots of international modern style. Due to this, late 60´s and 70´s represents the most successful era of soviet architectural design as well as for Georgian architecture. The design process and projection was organized in central state owned projection companies. Gruzgiprogorstroi was central projection company responsible for design of public building and cultural heritage restoration projects, other big company was Gorproject responsible for housing development and urban planning. Rural development projection was organized through Gruzgiproselstroi. Similar organization of the projection process was in every country of the East block (e.g. Czechoslovakia – Stavoprojekt). Even the work in the centralized projection companies was collective, the authorship and architectural creativity was respected. Late 1960´s and 1970’s opened the way to get on the train of European modern movement tradition. One of the best examples of this period in architecture is undoubtedly the Ministry of Highways in Tbilisi. Utopia of collective recreation was developed in the frames of postwar social welfare state politics on the both sides of Iron curtain. In the Soviet Union the idea of collective recreation, or recreation for the masses was implemented right after the establishment of the Bolshevik power. Recreation became one of the central aspect of the Soviet healthcare policy. Recreation served the wellbeing and productivity of workers. The roots of modern recreation goes to the interwar period in Italy and Central European countries, where the discussion about the typology of the recreation was one of the main themes of the theoretical work and architectural practice. While countries gifted with a sea coast, such a Yugoslavia, Bulgaria or Romania were creating summer resorts for the working class, other inland countries such a Czechoslovakia and Soviet republic of Georgia rich in hot mineral springs became hubs of institutionalized health recreation. The idea of collective recreation in healing spa resorts was the render of the ideal socialist society – so the spa resort architecture representing this utopia. While on the West, this idea was abandoned already in the beginning of the 1980’s, in the countries of Eastern Europe it continued to develop till the fall of the communist utopia. Today, these buildings are abandoned both physically and mentally. Even though in the region of Central Europe spa resorts build during the Socialist era are still in operation, the crucial idea behind – their social/healthcare/reproductive purpose – is disappearing under the pressure of the Neo-Liberal economics. Thus, during the last two decades the faith in this architecture went through different trajectories of transformation. 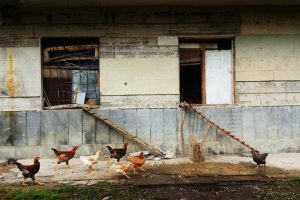 In Georgia the state of the deconstruction of this utopia gets dystopian character. It opens the question of value, significance and function of architectural heritage of the modern movement when confronted by political and social conflicts. During the decades, the specialized projection was slowly excluded from the central projection office and delegate onto autonomous specialized projection institutes. Such a state owned projection companies fulfilled the needs for more technically and typologically specified investments. In the 1960’s was in many countries excluded specialized projection for healthcare sector and healing spas resorts. In USSR such a projection institute was founded in 1967. In Moscow based central projection and research institute “Kurortprojekt” was established by the federal central council of profession unions. Under the Moscow Kurortprojekt, there was other three institutes based in Kiev, Sochi and the city of Piatigorsk in Stavropol Krai and another 9 branch offices in other Soviet cities, among them one in Tbilisi. In the core of a universal health care system which was partly introduced in the Soviet Union already in the late 1920’s is a crucial system of prevention, where healing spas both balneological and climatic played the main role. Institutionalized healing spa recreation differs from family recreation. While seashore resorts in Croatia, Bulgaria, Romania but even resorts developed during the development of the social welfare state in France or other Western European countries were designed for and operated for family recreation. Healing resorts were always meant to be a place for individual recreation. The worker or a person with health complications was send to spa for recreation lasting not less than 21 days. 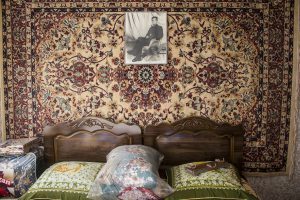 People from different corners of the USSR were interacting in standard double, three or more bed room. Sanatorium complexes were designed usually in capacity 250 – 600 beds. Accommodation, food preparation, dining rooms, social and cultural facilities like cinema theaters and optional healthcare departments were organized in one mono-block. In 1928 was founded scientific research Institute of Health resort science and Physiotherapy of the Republican association Gruzkurort under the Council of Ministers of the Georgian SSR. This institution since its establishment was responsible for scientific research of balneological potential of Georgian mineral resources. This institution was a decision maker for the future development of the spas in Georgia. Biggest spa locality in Georgia and one of the biggest in USSR was Tskaltubo in Imereti region, West Georgia. In Tskaltubo spa resort 22 sanatoriums were in operation before the fall of the USSR. The bed capacity of this resorts reached approximately 5000 beds with a year capacity up to 100 000 guests a year. The resort was mostly developed in the post-war period. Kurortpojekt played the important role in this effort, especially thru the personality of the architect Ioseb (Soso) Zaalishvili, who is the author of the Tskaltubo masterplan. Sanatoriums in Tskaltubo were realized mostly in the style of Socialist realism. The concept of urbanism was arranging the individual recreational monumental palaces (250-600 beds) separated from each other into the circle composed around the central park area, where the hot springs were situated. Architecture of modernism entered the resort in the end of 1960’s. 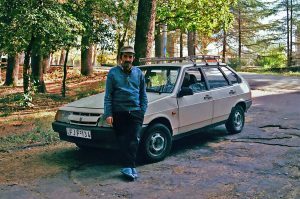 The best example is large Sanatorium Sakartvelo with 600 beds opened in 1987, designed by architects Merab Chkhenkeli, R. Janashia. Other famous locality is Borjomi in Central Georgia. This place famous by the bottled mineral water was developed already during the Tsar period. Some of the most successful examples of the spa architecture in this locality are Composer’s Union House in Borjomi (1973) by architects Sh. Davitashvili (Head of the project), N. Solovyova, M. Juruli, G. Metonidze, N. Karichashvili and Sanatorium Likani III (1969-1976) by Merab Chkhenkeli. Another interesting example of the Kurortproject production for Georgian healing spa development was the project for Sanatorium Mountain Valley in Borjomi. The realized structure constructed in the late 1970’s by architect Ioseb (Soso) Zaalishvili was only a fragment of the complex with the capacity 2000 guest. Several high rise dormitories arranged into the shape on a sloped hill with the structural facade was composed on both sides of the river Mtkvari (Kura) in the deep valley. Georgian Kurortporoject was responsible for sea resorts development as well. This both warm and subtropical seashore was a precious place during the Soviet time, where millions of recreants from isolated part of the world could have spent summer holidays or have had special health treatment. According to this, the coastline mostly in the Autonomous republic of Abkhazia was developed to provide modern recreational and therapeutical facilities. In Gagra, the most known resort of Abkhazian shore was constructed several therapeutical facilities of the international importance. 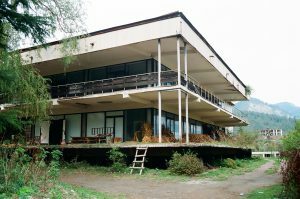 The steep slopes of the tropical like mountains influenced original design of the most of curative houses in this areal like Sanatorium Solnechni designed by architects R. Kiknadze, G. Metreveli and M. Chachanidze in 1979, Holiday home build for Union of Architects (1980, V. Abramashvili, R. Bairamashvili, I. Kaviashvili and D. Modbedadze) and Climatological rehabilitation center of Georgian SSR ministry of Healthcare. (1985, A. Bakhtadze, M. Laitadze, Z. Mamaladze, V. Mikeladze). One of the most famous Black sea resorts is situated 20 km from Gagra in Bichvinta (Pitsunda). The design of the resort of the international importance was searched by the architectural contest in 1960. The current, almost intact shape of the complex of the hotels with the capacity of 3000 beds was design by famous Russian architect Michail Vasilievitch Posokhin. The economic problems of the USSR in the late 1980’s advance signal of the later tragic events left many courageous project unrealized like the planned resorts in the Abkhazian city Ochamchire (designed by Ioseb Zaalishvili). The year 1992 is the breakpoint in Georgian modern history. Is the year which divide Georgian 20th century into two autonomous parts. After seventy years as part of Soviet Union suddenly Georgia has become independent sovereign state. In this year economy of the country decreased to one fourth of 1988 level. Unemployment and money inflation raised into astronomic rates. 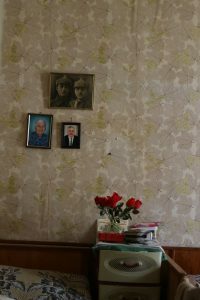 Social deprivation led to political crisis which opened the way to civil war in the 1992 in Tbilisi, and immediately led to war in Abkhazia in the years of 1992-1994. Due to war, 200 thousand people were forced to move from Abkhazia, located on the coastline of the Black sea, to the inland regions of Georgia. Many of the migrants were temporarily accommodated in the modern hotels, dormitories or healing spa resort developments. This people got the status of IDP’s. What seemed to be a short political crisis occurred to become an already 25 year lasting frozen conflict. In the year 1992, the sanatoriums were owned by state organization Janmrteloba, which was central state health insurance company based in Tbilisi. 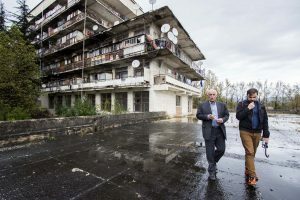 In autumn 1992, the ordered was given to the directors of the sanatoriums and other state-owned facilities with the accommodation capacity like hotels to open doors to refugees seeking for a shelter. The streams of the refugees were not organized and economically struggled society had no plan and capacity to solve the problem in another way. Till 1993, the hotels and sanatorium used to take care of all their new “clients”. 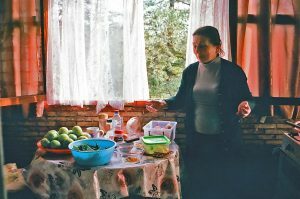 Later when people realized that the situation with their resettlement will not be solved, sanatoriums stopped to serve the new inhabitants and they got the permission to stay. The standard double room in the healing spa sanatorium has in average 16 square meters. This place was given to arch one family not counting of the amount of people in one room. The people started to take care of themselves on their own, customizing their new homes. Started gardening outside and refurbishing the rooms with the additional kitchen in the loggias. The whole process of transformation was unorganized action. The material and quality of added structures varied from simple wooden, plywood or sheet metal to brick walled structures. People to improve their living standards use the available materials in the locality. In some cases as a source of material was used the surrounding social, cultural or healthcare facilities. The strategies of the transformations were more detailed in the case of the IDP’s settlements of 2008 Russian – Georgian war. The actual condition of the building varies from place to place. But generally the bigger is the original sanatorium, the worst is its current physical state. Especially the former common spaces like dining rooms, administrative parts, kitchen and balneology, cinema theaters, these places were abandoned or robbed. On the other hand, also big sanatorium “Aia” was still in the more or less good shape. In general: Physical state of the former sanatoriums in Tskaltubo is bad and without any basic repair or sustain. This may be caused also by economic situation of the locality where huge unemployment is on face. In 1992-1993 when the sanatoriums were changed into permanent IDP’s shelter, nobody was thinking about the economic and social sustainability of the communities. 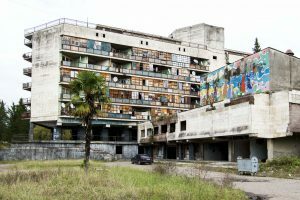 The most of the sanatoriums are currently in the state which does not allow the reconstruction to its original form or use. These buildings are un-reconstructable like the one of the largest Georgian sanatorium Sakartvelo in Tskaltubo, where in some moments up to 1000 people lived in slum like conditions. Today in Tskaltubo around 10 000 IDP’s are still living what means around 2000-3000 families. Originally in Tskaltubo 22 sanatoriums and one Inturist Hotel were operating. From this number only one sanatorium operates in its original form. This former Army’s Sanatorium is now privatized as spa resort. Two former resorts decayed into the heap of ruins and the rest 19 buildings function mostly as IDP’s housing. Georgia was for decades associated with political destabilization, war in Abkhazia and armed conflicts in South Ossetia. Architectural heritage of this country was overlooked. Last decade Georgia did a lot of political and economic reforms which stabilized the country and open the way to European integration. Due to thousands of years of following European way of thinking, Georgia deserved to be observed as part of European story. Architecture as the most ongoing aspect of each culture is one of the points where to start our observation. What seemed to be a short political crisis in 1992-1993 occurred to become an already 25 year lasting frozen conflict. Due to this conflict, in a short period of time, the original buildings, developed during the Soviet era for institutionalized collective spa recreation was by random, DIY participation process re-designed into the new permanent collective housing. The modern movement architecture was transformed under the critical social pressure. Uniqueness and utopia embodied in the architecture of collective recreation was swiped by social as well as political transformations. The purpose of unknown architectural heritage designed by the specialized projection institute Kurortprojekt and build on the fringe of the Soviet Union is in contrast with its current transformed state. It follows the processes and strategies of its post-traumatic transformations and its re-use due to historical social crisis. In this context, the title does not only refer to recreation as tourism, but to the original meaning of the word re-creation as re-modeling or adaptation. It opens the question of value, significance and function of architectural heritage of the modern movement when confronted by political and social conflicts. The presented research does not simply think about the physical state of Georgian spa architectural heritage, but examines social, political and economic ideas and realities behind it and behind the utopia of collective recreation. The paper was originally presented at the 15th International Docomomo Conference in Ljubljana 2018. Georgia is one of the fews in the world where both sea recreation and healing spa recreation is possible. E. Beyerm A., Hagemann., M. Zinganel, Holidays after the fall: Seaside architecture and Urbanism in Bulgaria andCroatia. Berlin: Verlag, 2017. Piatigorst is the city situated in the famous Soviet healing spas region known as Caucasian mineral waters. The region consists of the known spa resorts as Mineralnye Vody, Kislovodsk or Zheleznovodsk. A. Newsholme, J. A. Kingsbury, Red Health: Socialized health in Soviet Russia. New York: Doubleday Doran & co. 1933. Even the roots of universal health system in USSR goes back to 1920’s only in 1969 was spread equally also for rural citizens. E. Beyerm A., Hagemann., M. Zinganel, Holidays after the fall: Seaside architecture and Urbanism in Bulgaria and Croatia. Berlin: Verlag, 2017. Mikhail Vassilievitch Possokhine 1910-1989, from 1960-1982 The Chief architect of the city of Moscow. His work include the current Moscow monument as the New Arbat Avenue (1962-1968), Comecon Headquarter (1969), USSR Expo pavilion in Montreal 1967 and Osaka 1970.